There are so many pickup trucks on the market today, consumers may have a tough time zeroing in on a particular vehicle. If these potential buyers end up siding with brand familiarity, they’ll surely start to debate the 2017 Chevy Silverado vs. 2017 Ford F-150. Occasionally, when brands offer multiple engine options with a particular vehicle, customers will find that the accompanying specs typically suffer across the board. That isn’t the case with the 2017 Chevy Silverado 1500, as each of the truck’s engines delivers all of the power and efficiency a customer could possibly want. The 4.3-liter V6 engine is the smallest of the bunch, but it certainly shouldn’t be ignored. After all, the system manages to crank out 285 horsepower and a best-in-class 305 pounds-feet of torque, resulting in an excellent 7,600-pound towing capacity. Despite the power, the system still manages to deliver a 24-mile-per-gallon highway fuel efficiency. The 5.3-liter V8 boosts those power specs slightly, pumping out 355 horsepower and 383 pounds-feet of torque. Predictably, fuel efficiency isn’t compromised, as the unit still delivers a best-in-class 23 miles per gallon. Finally, the 6.2-liter V8 is reserved for those seeking the utmost power, as the unit produces 420 horsepower and 460 pounds-feet of torque, leading to a best-in-class 12,500-pound towing capacity. Fortunately, drivers won’t have to dish out extra money at the pump thanks to the 21-mile-per-gallon highway fuel efficiency. The 2017 Chevy Silverado 1500 is equipped with a number of preventative and protective safety features, safeguarding each occupant’s well-being when they’re traveling in the pickup truck. To help drivers avoid collisions or fender benders, engineers included technologies like Low-Speed Forward Automatic Braking and the Forward Collision Alert, which should prevent drivers from colliding with another car. Meanwhile, the Lane Keep Assist, Safety Alert Driver Seat, Front and Rear Park Assist, Rear Vision Camera, and Side Blind Zone Alert will also keep the pickup truck out of harm’s way. In the event that a driver does actually find themselves in an accident, they can rely on the pickup truck’s body to keep them safe and secure. The high-strength steel safety cage should play a role in keeping energy away from the occupants, while the six standard air bags will provide the necessary amount of cushion during a crash. Drivers can even lean on the OnStar Automatic Crash Response system, which will connect you with an OnStar Advisor following a crash. This advisor can subsequently send emergency help to the crash site. 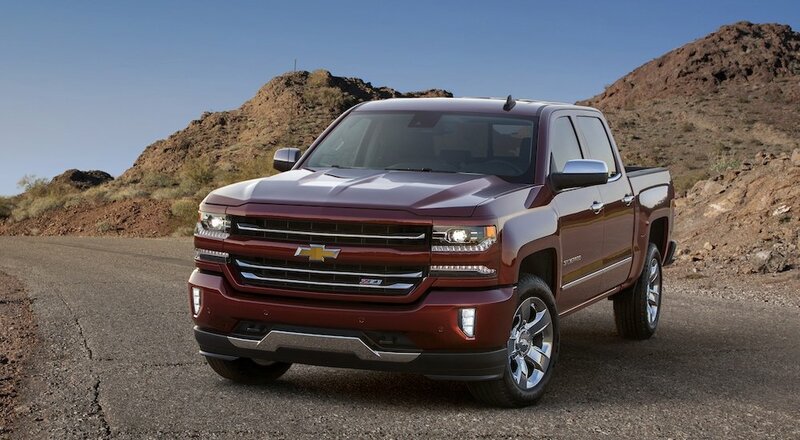 Chevy’s pickup trucks are generally known for their performance, but the vehicles also provide their owners with a serious selection of technological features. The Chevy MyLink system is the star of the Silverado 1500’s interior, providing drivers access to a number of applications, while also delivering amenities like hands-free phone calls and an extensive navigation system. Thanks to the wireless charging dock, drivers can also be confident that their applicable gadgets will never run out of juice. These technological features will also be usable when the driver isn’t even around their pickup. Thanks to the myChevrolet mobile application, customers can stay connected to their vehicle at all times. With the simple push of a button, owners can lock/unlock their doors, view important vehicle diagnostics, and even send directions directly to the in-vehicle navigation system. This pickup truck’s major safety offerings revolve around assisting the driver during a commute. Inclusions like the Lane-Keeping System and Blind Spot Information System basically provide the driver with an extra set of eyes, while the Pro Trailer Backup Assist allows drivers to constantly monitor and manipulate their large haul. Meanwhile, the “high-strength, military-grade, aluminum-alloy body” doesn’t only impact the rigidity of the vehicle, but it also influences passenger safety. If the Ford F-150 encounters an accident, the rugged body should maintain its integrity while also keeping any energy away from the occupants. Similar to the Chevrolet MyLink system, Ford includes their SYNC 3 technology in the F-150. Thanks to this inclusion, drivers can access their preferred radio stations or navigation service, and they can do so with the utmost convenience. The voice-activated technology allows drivers to easily choose their preferred application with the sound of their own voice. Meanwhile, FordPass plays a similar role as the myChevrolet application. Drivers can remotely access several aspects of their vehicle, and they can remotely check their truck’s fuel level. Via the application, owners will also have the opportunity to schedule maintenance reminders or ask for Roadside Assistance. If you thought the Chevy Silverado provided their customers with a number of engine options, then you’ll surely be impressed with Ford’s willingness to attach their F-150 to four potential engine offerings. However, when you start digging into the individual specs, you’ll learn that these units aren’t comparable to the Chevy pickup’s. The 3.5-liter Ti-VCT V6 is your standard small engine, delivering an underwhelming 282 horsepower and 253 pounds-feet of torque. While the brand touts fuel-saving technologies like variable cam timing, it only results in a 24-mile-per-gallon highway fuel efficiency. The alternative 3.5-liter EcoBoost engine delivers slight boosts to those specs, including an impressive 470 pounds-feet of torque. The 5.0-liter Ti-VCT V8 is a bit more hulking, and that predictably leads to upgraded power specs. This system pumps out 385 horsepower and 387 pounds-feet of torque, which is rather impressive when coupled with the 3,270-pound payload. On the flip side, the 2.7-liter EcoBoost V6 engine is for those seeking efficiency. The system cranks out 325 horsepower and 375 pounds-feet of torque, but drivers will be particularly enticed by the 26 mile-per-gallon highway fuel efficiency (when equipped with the 4×2 system). There you have it. When it comes down to the 2017 Chevy Silverado vs. 2017 Ford F-150, it’s pretty evident that the former option is clearly superior. Of course, you shouldn’t take our word for it. Rather, head into DePaula Chevy today and get a look at the pickup for yourself!